Dr. Stephen Trudeau is a clinical psychologist practicing in Malibu and Westlake Village, CA. His journey through difficult times began with poverty in childhood, and include; physical and sexual abuse in adolescence, drug addiction beginning at age eleven through his early twenties, the suicide death of his dear younger brother, being shot at by drug dealers, addiction recovery, motorcycle accidents, a broken heart several times, suffering from Major Depressive Disorder most of his life, a near fatal fall from a telephone pole, and dealing with the challenges of raising a special needs child. Stephen works in Malibu as an addiction specialist and has a private practice. He lives with his wife, Mary, and son, Devin, in Thousand Oaks, CA. enjoying the beauty of nature, music, art, science, and cultural happenings in Southern California. 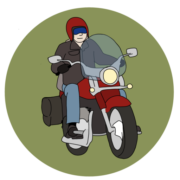 An avid motorcycling enthusiast know as “The Psych on the Bike,” he rides every day through the mountains and down by the Pacific Ocean. Son, Devin, rides along in the sidecar as often as possible. He lives a thriving life every day. 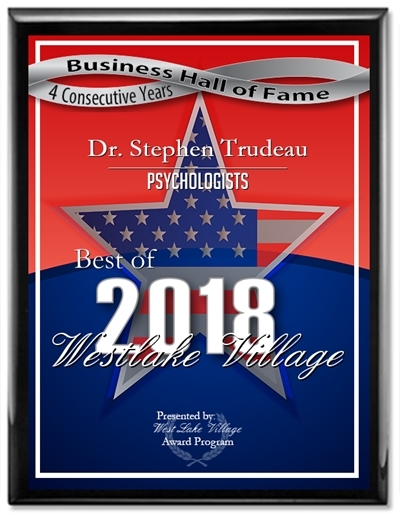 Dr. Stephen Trudeau is a licensed clinical psychologist practicing in Westlake Village and Malibu CA. for 17 years! He is highly experiences with addiction, depression, anxiety, life purpose issues, and parenting. He is currently a staff psychologist at Passages Addiction Treatment Center and a Group Facilitator at Milestones Ranch Malibu. He is the former Program Director at Sterling Behavioral Health Institute. Fear of public speaking is the number one fear in the United States! Not for Dr. Trudeau. He is most alive when speaking to groups of people. His highly entertaining and thought provoking style has been utilized by: Fortune 500 companies, major non-profits, faith based organisation, and addiction treatment centers. A big feather in his speaking cap is a TEDx Talk! Thrive Coaching has developed out of working with individuals who wish to improve the quality of life and personal peak performance. His clients include: international corporate CEO’s, Celebrities in Music – Movies – Television – and professional Sports, Entrepreneurs, Artists, Lawyers, and thousands of everyday folks. Dr. Stephen has written two books: The Special Needs of Parenting and Courage to Thrive. The Special Needs of Parenting, is a reflection of being a father of a special needs child, but also as a clinician seeing the similarities with parents whose children are at a deficit. His latest work, Courage to Thrive, has been very popular addressing the challenges we all face in overcoming adversity, but also seeking to live a Thriving life. This work has been translated into Japanese, and his support tour promoting the book in Japan was very well received. Subscribe to Dr. Trudeau Newsletter! Stay Connected!